The following is US centric, but most of the amateur bands across the world are quite similar. The following chart is borrowed from eham.com, and shows not only the band information, but also the frequency and how to use that particular frequency. Of course, the given use is only typical, it really depends on the exact propagation variables for the day in question. The UHF and VHF only require a technician license, the HF frequencies require a general and an amateur extra to get the full band width, but have portions available for CW and a very small voice segment for technician level.. This chart primarily focuses on the higher frequencies, there are many other frequencies avaliable. 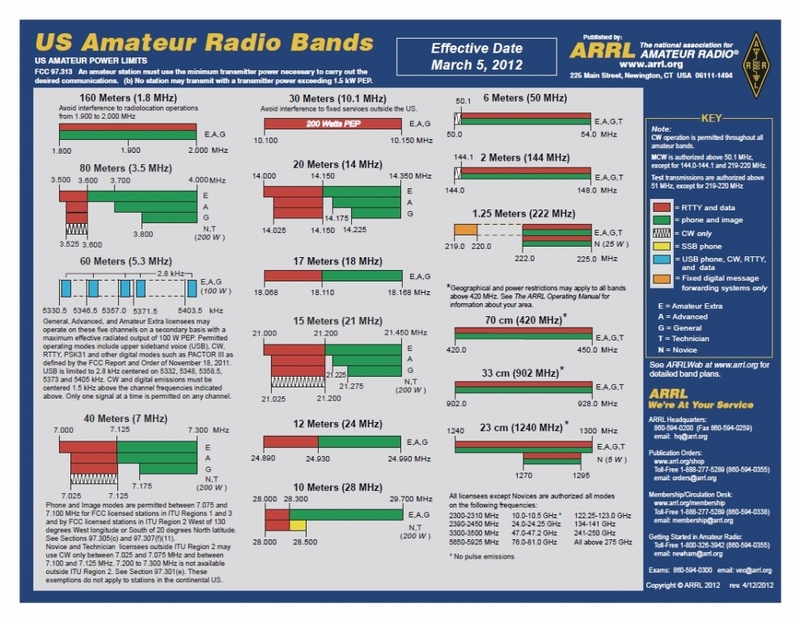 ARRL provides this chart to show all of the frequencies. ARRL provided chart showing all amateur frequencies, along with the associated license required to operate on said frequencies. Looking at these, you can see that the Amateur Extra provides a brief frequency increase vs the general class. I haven't yet had much experience with these frequencies, but I have been told they are choice among the bands. The most common frequencies used are the 2m, 70cm, and the 10, 12, 15, 17, 20, 40, and 80 meter bands. It is common for an HF radio to allow for both receiving and transmitting on multiple of the HF frequencies, for the UHF and VHF, most transceivers are limited to at most 2 bands. I should mention that there are two classifications on the chart that don't exist today. The Novice license was a former introduction to amateur radio, it required only Morse code and a simplified test. The Advanced license was a predecessor to the Amateur Extra class, but it was eventually decided that the two were redundant. I'm not going to explain how you can use one of these older licenses to get a newer license, as this is focused on newcomers to Ham radio, but I would start with this Wikipedia article. During the test for your license, you will often be asked specific points about this chart. I recommend that you learn the following advice, and consult the chart only if you are building custom amateur radio devices, as most transceivers will not allow you to transmit on non-amateur frequencies. 1. Speed of light= c= 300= frequency (MHz) * wavelength (m). The provided band names are only an approximation of the wavelength, but they are close enough that you can eliminate any answers that are far away from this approximation. IE, if the question asks for a 2 meter digital frequency, you can eliminate anything outside of the range 140-160 MHz. 2. There is an established band plan for every amateur band, which is a voluntary, but customary plan. To see these band plans, take a look at this page from ARRL. 3. Data tends to be at the lower portion of a frequency. 4. There are a few bands in which Amateur Radio is designated as a secondary. The primary band in which this happens is the 30m. Note that the power output is less for this band than any other. 5. The 60m band is limited to 5 pre-defined channels. 6. Keep 3000 Hz away from the edge of the band, to prevent transmitting out of band. If you can remember these points, you will be well on your way to even the Amateur Extra exam. For only a technician, only the first two are of critical importance. In short, remember these bits of things and you will be able to answer a significant portion of the amateur radio license exam.